Local transportation officials are pushing legislation in Columbus that could boost funding for the Southwest Ohio Regional Transit Authority and might provide more money for local projects such as the Western Hills Viaduct as well as a new way to raise funds from county taxpayers. The Cincinnati USA Chamber of Commerce, Democratic Hamilton County Commissioner Todd Portune and local Republicans hope Gov. John Kasich ultimately signs House Bill 26, a state transportation funding bill making its way through the General Assembly. The Hamilton County Transportation Improvement District, a clearinghouse for local transportation projects led by Portune, endorsed the bill on Monday. “We all know there’s not enough money to do everything we need to do,” said Rep. Doug Green, R-Mount Orab, chairman of the House’s transportation committee. 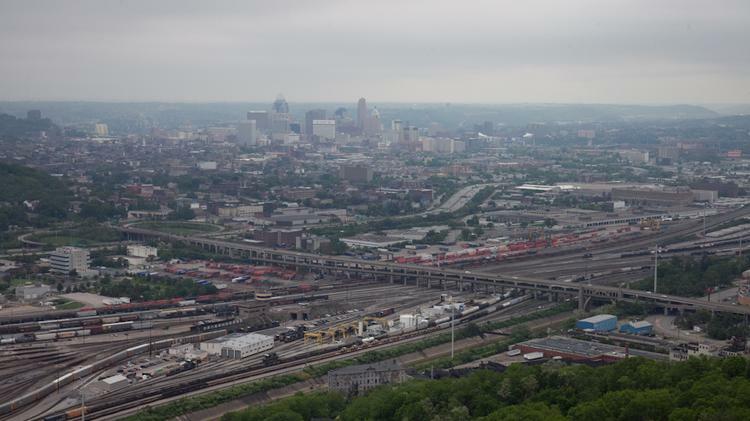 The bill directs the Ohio Department of Transportation to study the proposed Eastern Bypass of Cincinnati with the Kentucky Transportation Cabinet. It does not say how much Ohio will spend on the study, but the amount would come out of a $26 million pot of money the state sets aside for research in fiscal year 2018. Northern Kentucky leaders and residents who oppose the Brent Spence Bridge project have pointed to the bypass, which has been championed by developer Henry Fischer, as a viable alternative to the plan to add a second span alongside the current Brent Spence Bridge and expand the highway on each side of the river. Ohio officials and those at the Ohio Kentucky Indiana Regional Council of Governments have maintained that the bypass would be more expensive than the $2.6 billion Brent Spence project and not deal with the congestion problem on the current bridge or the fact that it is functionally obsolete. The legislation would increase statewide funding for transit from $23 million annually to $33 million. While that’s a pittance compared to what other states kick in, any improvement is welcome by local transportation leaders given that transit has not been a priority for Kasich and the Republican-controlled legislature. The funding increase comes three years after a state-commissioned report said Ohio needed to double what is spent on public transportation. The pro-public transportation group, All Aboard Ohio, also has been pushing for more transit funding. The bill sets aside $4.5 million for local transportation improvement districts. Local TIDs would compete with one another for the money for projects in which they have pooled resources with other local governments. The money could be used for preliminary engineering, detailed design, right-of-way acquisition and construction, according to the analysis of the legislation.